Save for the UConn tournament following Christmas the non-conference schedule is in the books for the 2009-2010 Minutemen. Now I realize that these games are important in terms of PWR/RPI/KRACH and whatever acronyms you personally adhere to but quite frankly next to the Hockey East slate, they’re nothing. I’ll always take the wins regardless but I think what may be more important are the lessons they learn out of conference to help prepare for another grueling Hockey East gauntlet. Lessons learned last night; do not take periods off, do not spot good teams 3-0 leads to start the game. At the same time the lesson that we, as fans, were introduced to against UNH, reviewed again versus Yale, and after last night have been well schooled in; this UMass team will not quit when down. Ok, no need to do a play by play recap, I’m sure there are much better ones in the paper (which I’ll link to anyway). Instead let’s address the main issues surrounding the game. The Meyers decision. It was certainly surprising to arrive at the arena and find Dan Meyers was getting the start. Meyers has played very well in his starts against Niagara and Yale but with the high profile matchup of the game against a supercharged offense, it seemed to me like Paul Dainton would be the choice. That said, was Meyers performance in the first period the difference of the game? Not in my opinion. He has certainly looked much sharper at times and the numbers do not look good, but it’s tough to put those goals on his shoulders. He was a bit shaky and gave up some rebounds but got very little help in clearing them out of the slot from his defensemen and with the offensive unable to maintain possession he had the puck in front of him way too often. While I was happy to see Dainton in net to start the second, it was because I hoped it would light a charge underneath the Minutemen (which I think it did) rather than a statement on Meyers’ play to that point. The first period. The thing that stood out in that first period was how conservative the team looked, both offensively and defensively. Quinnipiac effectively clogged both the neutral zone and the slot and prevented UMass from getting any rhythm offensively. Defensively I’m not sure what the team was trying to do in the first but once the team went down and had to open things up on both sides of the ice the defensemen seemed to be able to move in their own zone better and shut down the talented Bobcats forwards from then on. The comeback. Down by three goals Toot appeared to loosen the reigns and it seemed to make the difference. The offense responded to start the second and were able to at least put something on the scoreboard with a nice put back by Casey Wellman. The third was highlighted by a great shot and score by Will Ortiz and then just eleven seconds after a second goal by Wellman catching an unprepared Dan Clarke. The goal by Mike Lecomte to tie was a skill shot taking a rebound and roofing it straight up and in. But it wasn’t just a reawakened offense that got UMass back into the game and ultimately a lead. What made the difference was some great defensive work by Brett Watson, Danny Hobbs, and Ortiz on the forwards to keep the Bobcats out of the offensive zone. The interference call. I would love to see the interference called on Justin Braun with just over two minutes again. I didn’t have the best angle from where I was sitting but it looked pretty questionable from what I did see. Aside from some blatantly missed calls by the ECAC officiating crew on both sides (specifically some obvious offsides and an elbow to Marcou’s head that went without a whistle) the refs seemed like they were going to let a lot go in what was a very physical game. That’s fine with me, just as long as they’re consistent and they call it that way throughout. But they weren’t consistent when they put away their whistles for nearly the entire third period and then pull them out for a ticky-tack interference call on a faceoff. In the context of the many penalties which went uncalled throughout the game, it was ridiculous. That said, I refuse to say that UMass lost the game because of the referees. They lost because they gave one of the best offensive teams in the country a three goal head start to begin the game. The team was flat out dominated for that first twenty minutes. If the team played like they did in the following periods for even parts of the first and it never comes down to a Braun penalty or an overtime goal and the Minutemen leave Connecticut with a win over a top ten team for the second time in ten days. Not surprisingly I don’t think the team took the loss very well, completely understandable considering everything they had to do to get back in the game and even take the lead. I do hope however that they look back and realize how well they’ve played thus far, how well they played for good stretches against a skilled QU team, and I hope they play just as hard in the next few weeks. Six Hockey East points are up for grabs against three tough conference opponents between now and Christmas. I haven’t gone through all the box scores yet, but I have to assume that with 5 goals this week Casey Wellman will be getting some deserved recognition in the hockey world. But I like the FTT player of the game to go beyond statistics sometimes. Will Ortiz played a huge role in the comeback effort on both sides of the puck. Ortiz played some great defense 5 on 5, was key on the power play, scored the momentum swinging goal, put a body on anyone who came near him, and looked to be the emotional leader on the ice. Toot says the team lost in the first period in the USCHO recap. I have to agree. Here is a Quinnipiac viewpoint of the game from the New Haven Register. Quinnipiac has been added to the Road Trip page. TD Bank Sports Center is truly a very nice arena for an up and coming program and is a great symbol of the school’s committment to their hockey program. Frankly, I would think a UConn fan must be embarassed to find that the premiere college hockey arena in the state is located outside of Storrs. Frietas looks like a practice rink compared to both TD Bank SC and Ingalls Rink. Make sure to check out the comments of the Road Trip page also as readers have put in their two cents for good places to go for this weekend’s trip to Lowell. It’s that time of year again, UMass and Vermont meet tonight in the annual Turkey Tuesday tilt. I love that these two old Division II ECAC rivals get together for this yearly tradition. Unfortunately I haven’t exactly loved the results the last few years as the Minutemen have dropped the last three of these holiday week contests. Over the past ten years UMass is 4-5-1 in the pre-Thanksgiving matchups. Add in the fact that UMass has to travel to Burlington where they’ve gone 1-3-1 over the past three seasons and this is certainly proving to be quite a test for the squad. UVM currently sits at .500 both overall and in Hockey East, but they have yet to lose at the Gutt. They have done ok against top level teams, splitting a series with Denver and tying Lowell, but losses to Merrimack and Maine probably have some Catamount fans scratching their heads. UVM last played over a week ago when they split a series at Boston College by the scores of 1-7 and 3-2. Going into the season the biggest question mark was who would take over the scoring lost when Viktor Stalburg jumped to the Maple Leafs. I think the Catamounts are still waiting for that answer as they come in ranked 7th in the conference in scoring offense and sport the worst power play at just 12.2%. UMass is coming off a thrilling overtime win at #9 Yale and enjoy their first top ten ranking of the season. If they want to win at the tough environment that is Gutterson Field House they’ll have to cut down on the mistakes that allowed Yale to stay in the game last Thursday. UMass dominated play through most of the first two periods but the Elis were able to stick around and ultimately take the lead due to the Minutemen taking too many penalties and turning the puck over in their own zone. Every time UMass had a little bit of momentum the whistle would blow and they’d find themselves shorthanded. While UVM doesn’t have much of a power play it’s still important for UMass to have their best players on the ice. The team continues to get production from all four lines, with three of them on the ice for the four goals last week. I’m guessing Toot will keep the Syner/Carzo/Boehm line together as they clicked very well and led to a number of odd man rushes against Yale. With Madore’s struggles so far this year it’ll be important to challenge him early and hopefully put one in the net to shake his confidence. Here are the UMass game notes for tonight. The Republican talks about the impact of T.J. Syner’s return in the Yale game. Here’s the preview from the Gazette. Here’s the view of tonight’s matchup from the Burlington Free Press with the late news that Mike Spillane will probably be in net. INCH mentions tonight’s game as one of the highlights of the holiday week’s schedule. Rankings, shmankings says the Collegian preview. The road trip continues in their notebook section. Unfortunately I won’t be able to make the trip to tonight’s game but for those who do make sure to take a look at the Road Trip page for some suggestions on one of Hockey East’s best destinations. I will however be Twittering updates. Also, remember that with tonight’s hoops game going at the same time the hockey broadcast will be available only through the internet. UMass moved up to #9 in the most recent USA Today/USA Hockey poll. James Marcou was named one of the Hockey East Top Performers for last week. 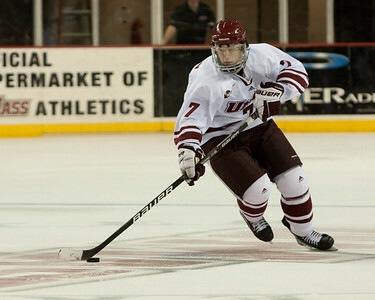 Marcou was also named the UMass Athlete of the Week. A weekend free of UMass hockey games afforded me the opportunity to get out and try and see some of the incoming recruits playing in the area, something I enjoying doing whenever feasible. So yesterday without a reason to truck all the way out to Amherst I only went halfway instead to watch the EJHL’s Green Mountain Glades take on Colin Shea and the Junior Bruins in Marlborough. He’s a very smooth skater, he even may have a little speed. The entire game he was very poised and relaxed, even at the end when things got chippy. He played smart on defense, putting himself in good position. His greatest skill is his poke check which stymied the Glades all game long. Offensively he was solid. He made good outlet passes and moved the puck well both on offense and on the power play. He seems to have a solid wrister but he only used it a couple times. His slapshot needs work however both in terms of strength and accuracy. He seemed to like to jump up into the play when possible and didn’t hesitate to skate down with or even lead the rush (similar to what we see from Justin Braun). He finished the game with two assists, one on a slapshot that was stopped and put back in by a teammate and the other I think was him cycling it down for the goal. I believe he was on the ice for four of the five goals (EJHL doesn’t have +/- on box scores), played on the first pairing and was on the first PP and PK units. Now to the elephant in the room, he is very skinny. He certainly has good height, but I think the 170-175lbs published is accurate. 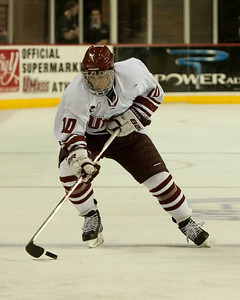 The weight and his slapshot are the two things that pose the greatest challenges to him having success in Hockey East. His poke check is excellent but there are times when you have to pinch someone up along the boards and he’ll have a tough time doing so currently until he bulks up. I wanted to offer to take him out for a couple prime ribs and perhaps a pizza or two after the game but I don’t think the NCAA would’ve appreciated such a gesture. – Joe Pendenza. Lowell bound forward who had a good two-way game. – Justin Breton. Had two goals in the game, looked to be the main scorer. Heading to Bentley. – Dan Federico. Shea’s defensive partner. Unsigned. Son of Hockey East linesman? – Joey Yeadon. Only a junior. Unsigned. High energy, was all over the ice. – Matt Esposito. Unsigned. Looked to be Glades best player. 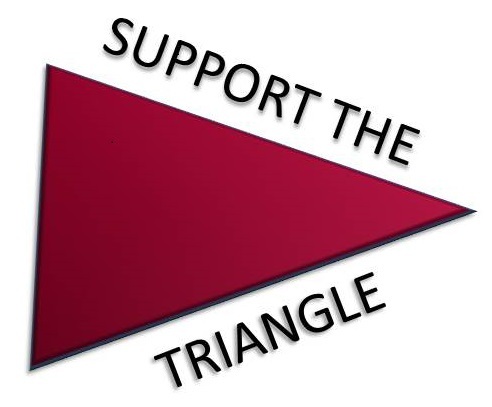 I’ve been able to add an Alumni page to Fear The Triangle hoping it will be a central place to keep track of where all the former Minutemen are playing or coaching nowadays and see their up to date stats. I think I have almost everyone covered, mostly thanks to HockeyDB. I’ll do my best to keep it up to date as guys change teams, etc. There are a few players that I think are probably still playing somewhere but I couldn’t track them down, namely Scott Crowder, Kelly Sickavish, and most surprisingly Stephen Werner. If anyone has any information on these three or any other UMass alums who are still in pro hockey in some way, shape, or form, please email me or use the comment function on the page itself. New England Prep hockey begins today with an exhibition tournament out at the site of UMass’ latest win, Yale’s Ingalls arena. Cushing and Conor Sheary will be in action. John Parker assisted on three of Indiana’s four goals last night as the Ice beat Chicago 4-0 in USHL play. Parker was named the game’s #2 star and had a +3 on the game. For those that missed it, could’ve-been Minuteman John Carlson made his NHL debut for Washington on Friday. He became the youngest Cap to do so. Recaps say he played pretty well and even hit a post.